With growing automation requirements across different verticals, there is a rapid shift from hand tools towards power tools in India. Power tools offer certain key features such as durability, precision, better performance, and time efficiency. India power tools market revenues are further driven by surging demand for these tools majorly across construction, industrial and automotive segments. Although, international brands including Bosch, Stanley and Makita are the key players in the market, however, locally manufactured products are preferred by price sensitive consumer segment such as DIY (do-it-yourself) and residential users. According to 6Wresearch, India power tools market size is projected to grow at a CAGR of over 8.4% during 2018-24. Electric power tools segment bagged the highest revenue share in 2017. The segment is anticipated to continue its dominance over the coming years on the back of higher performance, cost efficiency, and ease of use. Further, in terms of tool types, concrete segment contributed majority of the revenue share in 2017, followed by metal and wood working segments. Moreover, the Southern region contributed largest India power tools market share in 2017, attributed to the presence of robust industrial sector in the region. In addition, the Western region is projected to exhibit highest India power tools market forecast revenues on account of flourishing construction and industrial segments over the coming years. The India power tools market report thoroughly covers India power tools market by technology, tool types, verticals, and regions. 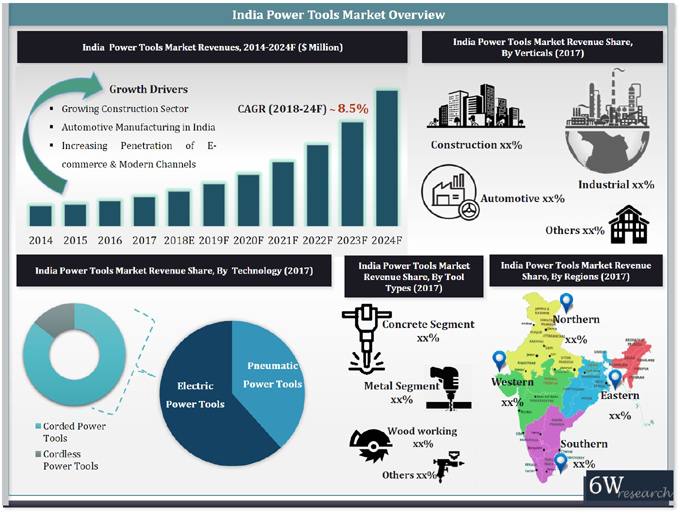 The India power tools market outlook report provides an unbiased and detailed analysis of the India power tools market trends, opportunities/ high growth areas and market drivers which would help the stakeholders to decide and align their market strategies according to the current and future market dynamics. 14.2	Stanley Black & Decker India Pvt. Ltd.
14.3	Makita Power Tools India Pvt. Ltd.
14.4	Hitachi Koki India Pvt. Ltd.
14.5	Hilti India Pvt. Ltd.
14.7	FEIN Power Tools India Pvt. Ltd.
14.8	Atlas Copco (India) Ltd.